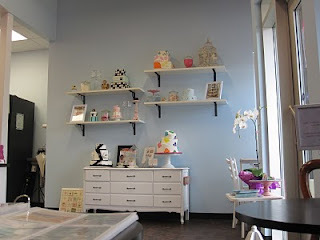 Update 2014: Whimsical Cake Studio now has a new owner Darcy Scott. Go make a visit to check out her cupcakes, awesome cake designs and her well known caramels! 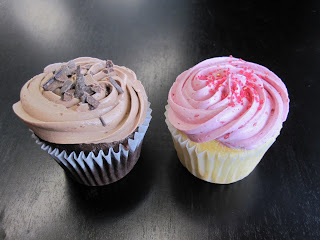 Met up with a friend today to try out Whimsical Cake Studio's cupcakes. 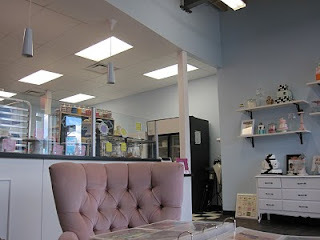 The store front is highlighted with various cakes and the inside is incredibly cute, yet still classy. Located to the right of the Garneau Theatre it's easily accessible for pedestrians, but may prove to be slightly difficult for those finding parking as they have no dedicated parking lot. Once inside, I found my friend flipping through a giant book of pictures detailing the various cakes that they've made for kid parties, bridal showers, baby showers and weddings. We sat in their comfy chairs for a bit, admiring the sample cakes adorning the store - one in particular which we loved with dark chocolate tones & baby blue circles on a rectangular 3 layer cake -, the atmosphere (the owners were busy preparing cupcakes in the open kitchen), and glancing at the laminated newspaper clippings easily accessible on a magnetic pole. There were about 8 different cupcake flavors that were available when we finally made our way to the counter. These ranged from those with a vanilla or chocolate bottom and had either a sugar icing or buttercream topping. We both opted for those with buttercream as we felt that it would be less sweet; plus the description indicated that it would be fluffy. They kindly boxed it into a plastic to-go container as we both wanted coffee from next door's Dacapo. Plus, coffee and cupcakes always make a great pair! Cupcakes are an interesting dessert/snack (depending on when you want it). Most of us who bake can make it themselves, but when it comes to buying there are a few criteria that I look for. The perfect cupcake depends highly on the slight crust on the top of the cupcake as you bite in (and this not from sitting out too long), not too sweet of a buttercream or icing topping, and a moist inside (not due to excessive butter). Now the crust is hard to maintain, as the icing or buttercream can impede the crust from remaining from the time the cupcake is finished to the moment that a cupcake enthusiast takes his/her first bite. My first impressions of the chocolate haze cupcake was good. It had a crust! The buttercream true to its description was fluffy and the cake was moist with a hint of buttermilk. The Raspberry vanilla cupcake was also consistent in texture and had a nice crust. The fluffy buttercream, moist insides and the raspberry flavour of the buttercream truly came out as you ate. Both cupcakes we agreed, still felt a bit sweet to eat on their own, so the coffee helped tremendously to balance the taste buds. Well, seems like Whimsical has my vote for cupcakes! 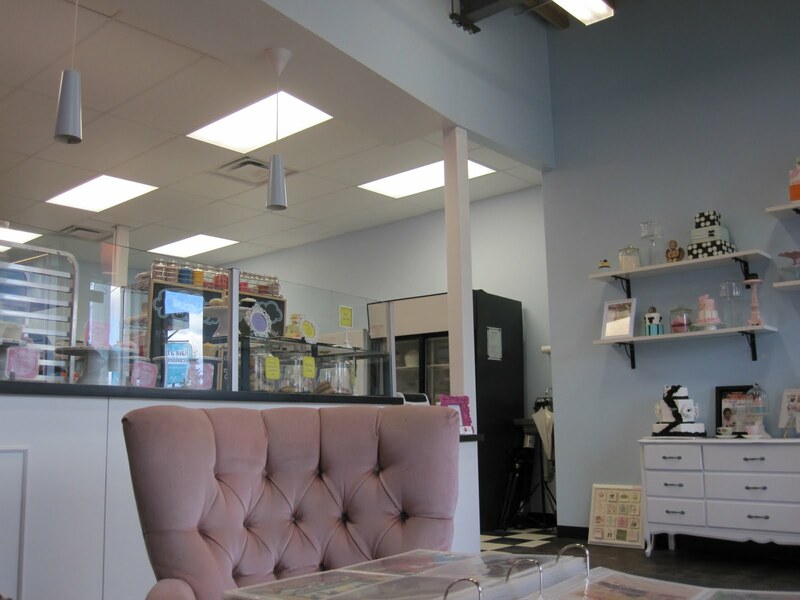 I wish them the best of luck as there are now 3 cupcake shops within rather close proximity to each other (both Fuss Cupcakes & Flirt Cupcakes located a block away from each other on Whyte Ave). They were originally on Riverbend so we'd always pick a couple up. So delicious! How is Flirt? Are they just as good? I haven't tried Whimsical cupcakes yet, but after eating at Flirt and Fuss a few times I definitely prefer Flirt. I agree with your cupcake criteria, and I would add a few more: cake has to have a good flavour that doesn't taste artificial, and frosting can't be so be oily, with the mouthfeel of edible oil product. I find that Fuss fails on both these counts. I will be interested to try these! Nice shout out from Liane, in he Journal, eh? You did see it, I assume! you need to change the color of your font! Other than that good review! Mmm... cupcakes! I love when my friends and readers post comments. If you do try a recipe, let me know! I would love to hear from you! You can also contact me through twitter or Facebook. Your comment will be visible after I have the chance to see it (due to the amount of spam).